Kaspersky Lab has dedicated resources to finding new ways to secure computing systems with various antivirus technologies. The Kaspersky Anti-Virus, Internet Security, and Total Security are three main products featured by the company. These offerings make Kaspersky one of the frontrunners in security software. Owing to the technological uncertainties, installing an antivirus is crucial. Computing systems and information networks are under a constant threat as hackers are always looking for a way to gain unauthorized access to personal information of the users. When it comes to antivirus, the setup is a crucial step to ensure total protection for your computer. Kaspersky’s antivirus is simple to set up and provides an interactive user interface that saves your time and efforts. The antivirus is designed to provide a hassle-free experience on multiple platforms and can be installed quickly. Kaspersky offers multiple language options to make it more user-friendly and create a personalized operating experience. A good internet connection is mandatory across all supported devices and platforms for product activation and periodic updates. All it takes for Kaspersky antivirus to perform well is a minimum processing speed of 1GHz. The 32 bit or 64 bit Windows operating system is more than enough for the antivirus to run silently in the system tray with a 2 GB internal memory support. Similar memory and processing requirements are applicable for Apple systems. The antivirus is also designed to run on smartphone operating systems including the Windows Phone 8 OS, the iOS 9.0 or higher, and Android versions 4.1 to 8.1. Kaspersky antivirus does not significantly impact the system performance or affect the existing processes of the operating system. However, Kaspersky Internet Security and Total security require more power while performing tasks in the background that may slow down certain system processes. The configuration of your computing system will again determine the impact of the antivirus on other processes. Kaspersky Anti-Virus, Kaspersky Internet Security, and Kaspersky Total Security feature different bundles of security and protection tools. Virus and malware detection and removal is one of the main features of an antivirus, and Kaspersky ensures an efficient process that eliminates threats from within the system. The antivirus also simultaneously blocks malware intrusions in real-time without using too much memory or processing speed. Kaspersky Anti-Virus offers good security options with protection against viruses, spyware, and phishing. It blocks access to dangerous websites. Digital signature matching and heuristic monitoring ensure scans for known malware and blocks them at the source, making it the first line of defense. Among the many features, Kaspersky specifically offers a vulnerability scan that fixes flaws in older system files and residual software files. These flaws slow down the system and the antivirus manages everything while running in the background and functions well with limited system requirements. Kaspersky Internet Security goes one step further and offers additional protection with free VPN support, parental controls to block inappropriate content, and anti-spam protection. You can stop worrying about visiting a website that you are unsure of with the safe money plugin and a two-way firewall. Kaspersky also provides webcam protection to stop third-party applications from spying via the camera. Kaspersky Total Security is a combination of everything that the Kaspersky Anti-Virus and Internet Security have to offer. Total Security also features parental control tools with a secure password manager that allows easy access from multiple devices. If you are worried about your child’s online activities, Kaspersky Total Security blocks inappropriate content and the Safe Kids option enables your child to explore the digital world without any threats. Total Security is the premium subscription among Kaspersky products that offers file backup and encryption system. You will never have to worry about losing your favorite pictures, songs, or important files to a malicious virus or malware attack. 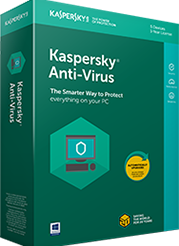 Kaspersky Anti-Virus safeguards every little aspect of your personal computer or laptop with protection that can be currently bought for a discounted price of $20 approximately. Kaspersky Internet Security, which has additional features is currently available for a discounted price of $40 approximately. You can directly purchase and download the software from the official website. Kaspersky Total Security offers complete protection for a discounted price of $50 approximately. All the three versions of the antivirus can be bought for a single system or for a maximum of 10 computers and devices. Although all the three offerings by the company are useful, Kaspersky Total Security delivers a comprehensive combination of PC and internet security. An array of additional features is more than enough to protect your system from online threats, despite higher processing speed and memory requirements. The customer support of Kaspersky also offers comprehensive solutions for grievance redressal.